The Farmers Arms is a beautiful old country pub which has been here since the 1800's. You'll be welcomed into a lovely interior with traditional wooden beams and pillars now mixed in with modern art, throwing a great mix into the atmosphere. Having recently changed hands the pub is food led with fantastic new Landlords, chef Jules producing freshly cooked food, and in house butcher, Jason who sources local fresh meat. 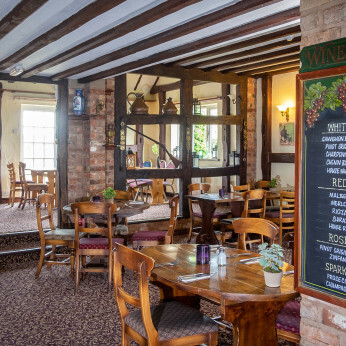 We serve a lovely lunch menu alongside delicious set priced 2 course and 3 course lunches, with a separate dinner menu. Walking, cycling and running groups are regularly catered for with set menu choices being provided. We pride ourselves on delivering excellence in product and service. Come along and visit us. We welcome dogs and are family friendly. With a large beer garden there is plenty of outdoor space. We have plans for a children's play area very soon too! Come and join us for new years eve for music, food, and fun!! Our daily Christmas menu starts throughout December. Christmas Menu available for the month of December. Christmas day menu now ready, call to reserve your space.